Pink might have had some bad blood with Christina Aguilera in the past, but the "Try" singer says that it was their tumultuous history that made Aguilera the most fun coach to work with when she recently served as a guest advisor on The Voice. "Her and I have had history and it hasn't always been wonderful," Pink told ET's Carly Steel at the red carpet premiere of Alice Through the Looking Glass at the El Capitan Theatre in Hollywood on Monday. "I think it just took us 15 years and I feel like there was true love and it felt really good." "I love when you're around long enough to have a full circle moment and that was a full circle moment for me because in all honesty, I'm a fan of hers," the 36-year-old GRAMMY winner continued. "It was just a really refreshing, nice visit." 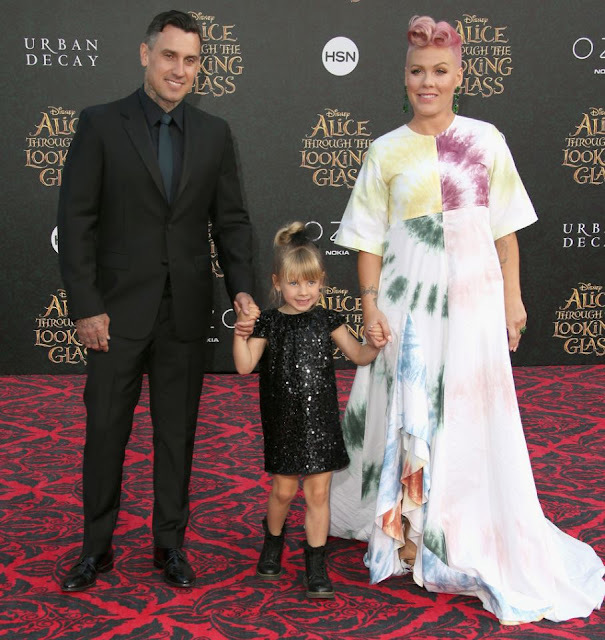 At the premiere of Disney's fantasy adventure sequel, Pink was joined by her husband, Carey Hart, and the couple's daughter, Willow, who turns five next week. Willow joined the singer while she spoke with ET, and complimented her mom's "awesome" performance at the premiere, which came just one day after Pink's high-flying routine at the Billboard Music Awards. And, as it turns out, Willow is following in her mom's footsteps. "She actually has a silk in her playroom so she's her own little acrobat," Pink explained. "She's not very impressed by me, which I like. [If] you can do it yourself, why would you be impressed?"